If you are going for just a few hours on your boat, let someone know where you expect to be and when you expect to return. File a float plan. If you plan a longer cruise, leave a copy of a written float plan with your marina, yacht club, or friend. A float plan includes a description of your boat, who is on board, a description of the safety equipment you are carrying, where you expect to be, and when you expect to be there. Instruct the person holding the float plan to notify the Coast Guard or other appropriate agency if you do not return within a reasonable time after your scheduled arrival (taking into account weather, etc.). Here in the Houston area, we operate on inland waters, Galveston Bay and other large waters, including the Gulf of Mexico. Regardless of your boating operating area, if a search-and-rescue operation is necessary, the float plan will narrow the search area and help rescuers do their job more efficiently and effectively. When you arrive at your destination, or if your plans change, notify the person holding your float plan to avoid unnecessary worry and possible waste of search and rescue resources. There is no special or official form that you must use, though you may find convenient pre-printed ones available in boating supply stores and catalogs, or you can generate a customized form using our template. Do not attempt to file the form with the Coast Guard. The Coast Guard will not accept float plans. 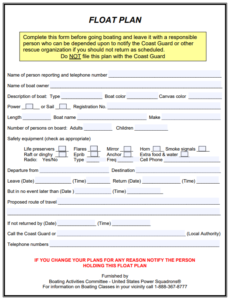 Complete this form https://www.usps.org/national/vsc/float.pdf before boating and leave it with a reliable person who can be depended upon to notify the Coast Guard or other rescue organizations in case you do not return as scheduled. A word of caution: In case you are delayed, and it is not an emergency, inform those with your float plan, the police and/or Coast Guard of your delay in order to avoid an unnecessary search!